We have a wood rot technician on every exterior painting crew. Experienced wood repair men with vast knowledge in all types of rotten wood repair scenarios; and can give a detailed scope of the most efficient method to repair wood rot on your Jacksonville home or business. Rotten wood or "wood rot" can cause problems. Here in Jacksonville’s moist climate damaged wood is going to be found on your home’s exterior. This can include; rotten wood siding, rotten door trim, wood rot, window trim rot, rotten fascia, etc. We offer several exterior wood rot repair options and carpentry services. Including: rotten wood trim, repair rotten jambs, repair rotten siding, repair door wood rot and repair wood rotted frames. ​Wood repair or wood replacement can be a costly maintenance issue for your Jacksonville home. 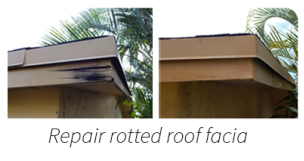 Learn how rotten wood repair specialists not only repair rotten wood; but offer replacement of rotten wood with non-rotting composite materials, eliminating wood rot at your Jacksonville home, forever! In many cases we offer non-rot materials as a rotten wood replacement option; instead of similar wood that rotted in the first place. These wood replacement composite materials that will not rot! Rotten wood repair, trim repair and wood siding repair doesn’t have to be an issue for your Jacksonville home anymore. Replacing wood rot areas with no-rot materials such as; Hardie board siding, Trex, Mira, Azek or PVC trim eliminates wood rot repair. These wood alternatives beautify and will not rot under any conditions; even in Florida's sub-tropical climate. Here in Jacksonville we approach rotten wood repair, siding repairs differently than most. When wood rot repair, rotten wood trim repair and rotted siding repairs are needed on a Jacksonville home; there is a cause as to why this is happening. We not only replace or repair rotted wood; but also identify the cause and strive to eliminate that cause; eliminating future wood repairs. This can be done in several ways; by improving angles on wood where water sits or with a waterproofing materials applied in troubled areas, etc. There are several methods used to repair rotten wood. Replacement of rotted wood may be mandatory; however; in some cases an epoxy resin repair method can be used to repair wood rot. A tried and true, widely used wood repair method that saves you money! Epoxy resin is a cost efficient alternative to replacement of rotted wood. As you see in the picture to the left; replacing this fascia would disrupt the roof and cause a joint near the corner (depending on the length of replacement). Epoxy resin was used to fix this wood rot and the wood repair is perfect; never to rot again! Epoxy resin won't rot or deteriorate even under the harshest exposure to the elements. Jacksonville wood repair company at it's best!!! !